Continuing a beloved yearly tradition that's endured for more than 25 years, this keepsake 2015 Holiday Barbie doll is festively dressed to ensure this will be the most glamorous season of all. 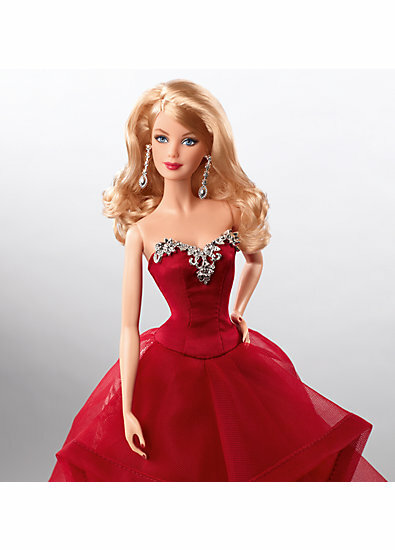 Inspired by merry colors and jingling bells, Barbie wears a dramatic garnet-colored gown with cascading ruffles and an underskirt of silvery foil brocade. The strapless bodice is trimmed with silvery leaves accented with clear, sparkling gems. Her hair has glamorous loose curls that showcase a pair of ornate earrings. Comes in premium gift-able packaging so it's easy to make holiday wishes come true for girls of all ages. Each doll sold separately.